Uncommon Co. is an HR company using AI to match recruiters with qualified and interested candidates with their B2B product. In this 3 week design sprint, they asked our team of 3 students to design a new B2C product for job seekers. 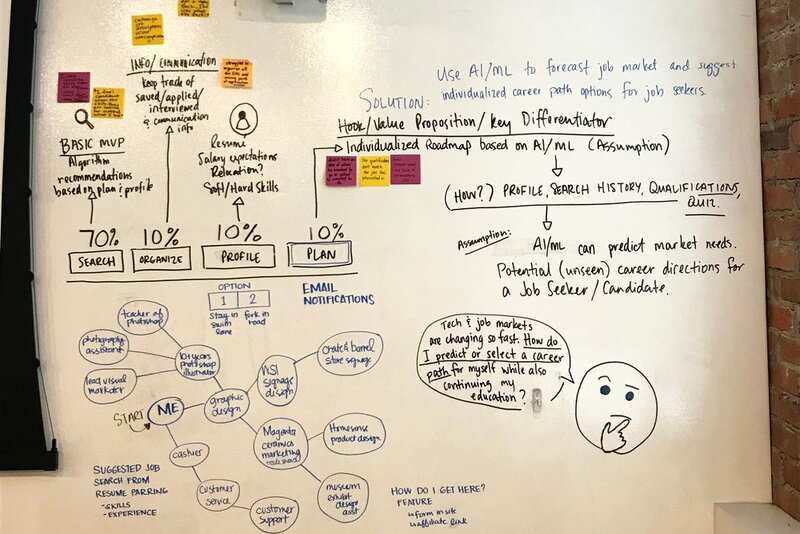 Rather than job seeker's looking for jobs they know they're qualified for, use Uncommon's AI capabilities to generate previously unconsidered career paths. Use resume parsing and user data that the job seeker shares, discern hard and soft skills, values, and career history to provide a unique value proposition: career planning for the next generation. Market research, comparative analysis, user interviews, affinity mapping, and job seeker journey mapping were used to gain empathy and understanding of the current experiences and challenges that job seekers face. Our team separated and we each came up with solutions to the job seeker problems we distilled from our affinity map. We reviewed each other's ideas and combined them to create an innovative solution. It can be hard to get everyone at a company to buy-in to the Product Designer's vision. I created these design artifacts for the CEO and Product Manager for when we pitched them our design solution. Together, our team decided what the user flow through the app would be and what each screen's wireframe would contain. My other two team members designed the look of the screens in Sketch and I shared my feedback on areas that required improvement. Together we tested the app using in person user testing that measured qualitative and quantitative data. There were multiple rounds of edits on the wireframes and user flow until a final design was reached. In the end, our team decided to provide our client with wireframes for a mobile app and a responsive website. The responsive website is useful because move job seekers were searching for jobs on their phone and then applying later on a desktop. The mobile app would allow the company to maintain a competitive edge and to better personalize the experience for users.